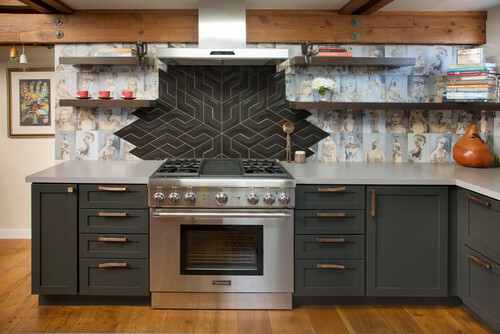 Here are 62 standout kitchen backsplashes that you can use as inspiration for your own kitchen renovation. Click the first image to enlarge the photo, then use the right arrow to see the photos in slideshow format. 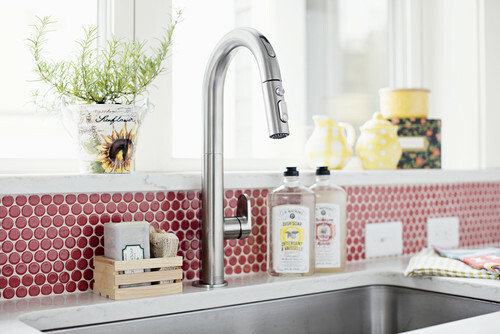 Flip through and then tell us: Which kitchen backsplash would you most like to have in your home? 1. 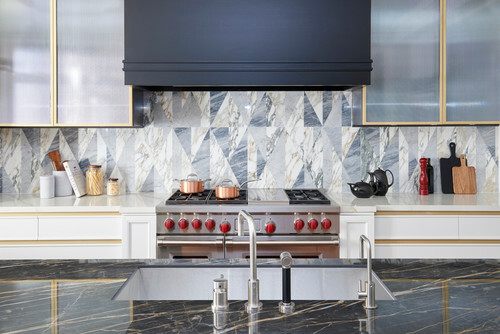 A patchwork backsplash of inlaid marble in soft colors complements the gold details that frame the cabinetry in this Toronto kitchen. 3. 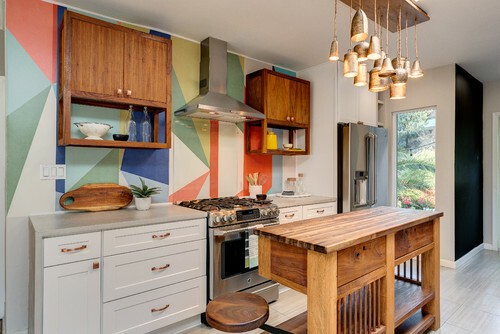 This remodeled midcentury kitchen features a retro pattern that the designer compared to the print used for Diane Von Furstenberg’s famous wrap dresses. 4. 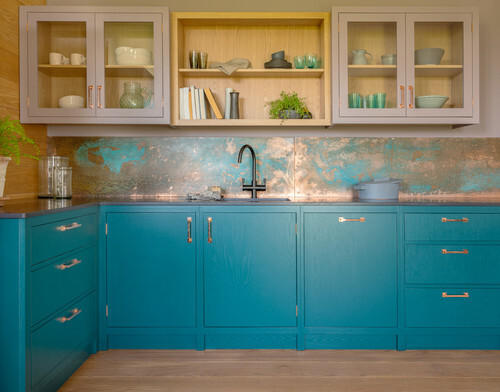 The backsplash in this Norfolk, England, kitchen is copper that has been intentionally aged to get its lovely patina. 5. The backsplash in this Toronto kitchen is composed of a single piece of quartz. 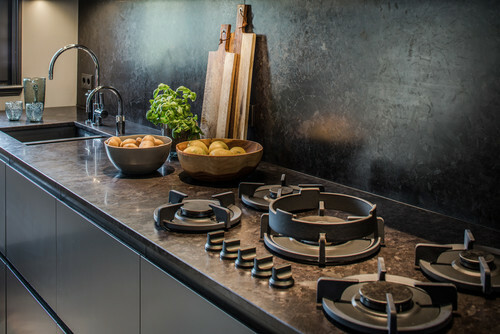 The same material is used for the countertops. 6. Swimming fish make a fitting backsplash for this home in Saint John, the port city in New Brunswick, Canada. The backsplash is actually wallpaper. 7. 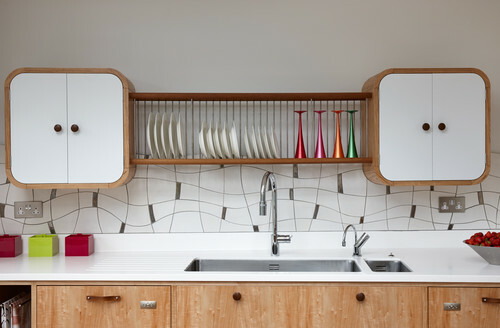 The glazed porcelain backsplash tile in this Toronto kitchen was inspired by woven textiles. 8. 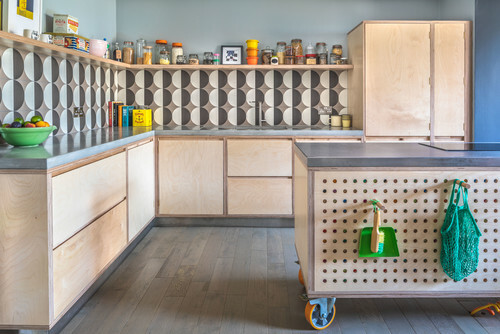 This London kitchen features handmade bespoke tiles in what the designer describes as a spider pattern. The silver pieces interspersing the white are platinum-glazed. 9. 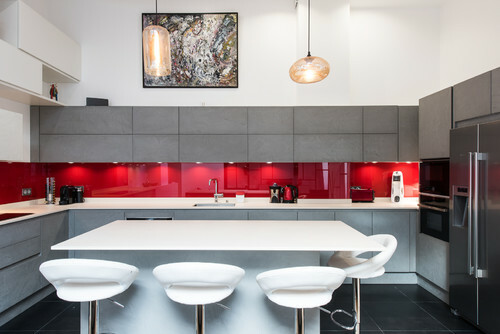 Red-tinted glass warms this kitchen in Paris, offsetting the cool gray cabinets and white countertop. 10. The fan-shaped backsplash tile is the standout feature in this Atlanta kitchen. The soft gray cabinets take a back seat to the dramatic tiled wall. 11. 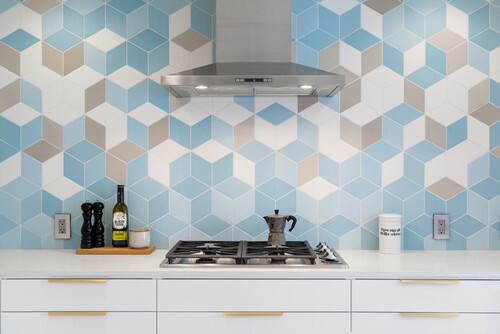 Geometric tiles bring energy and cheer to this Bristol, England, kitchen, which has birch plywood cabinets. The round shape on the tiles echoes the peg holes on the back of the kitchen island. 12. Penny tile makes a statement in this Devens, Massachusetts kitchen, which has classic white cabinets. The design was part of a collaboration with This Old House magazine for a show home. 13. 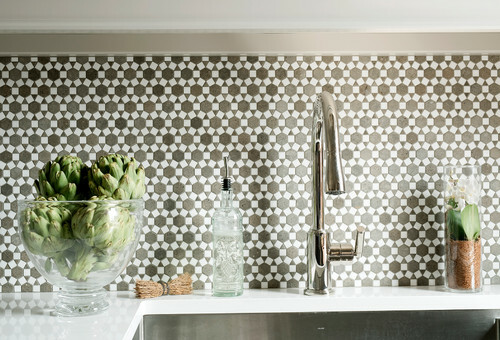 This kitchen in Belmont, Massachusetts, gets a Moroccan effect thanks to this beautiful patterned backsplash tile. 14. 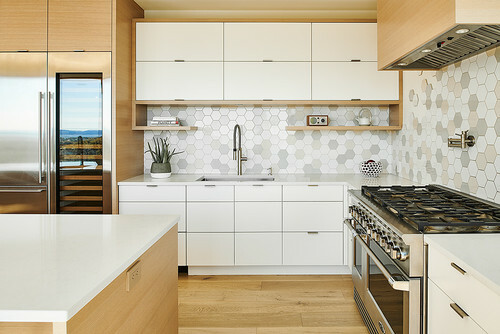 The hexagon tile in this Victoria, British Columbia, kitchen in white with irregular sprinklings of neutral gray and taupe does two things visually. First, it reinforces the kitchen’s neutral palette, echoing the color of the cabinetry, floor and appliances. 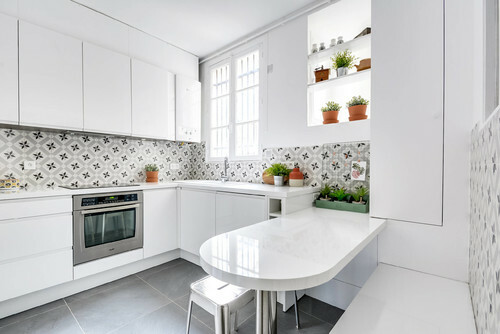 And second, it amps up the fun factor in this space — note especially the scattered tiles to the left of the range hood. 15. 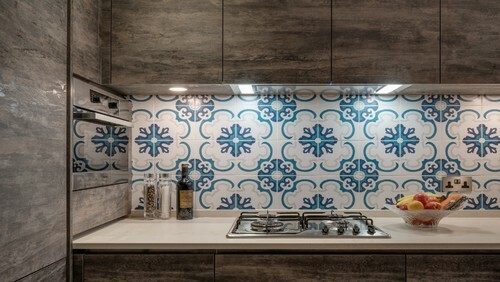 This kitchen in Hong Kong features graphic tile similar to the beautiful cement tiles that have also been trending in American kitchens. 16. 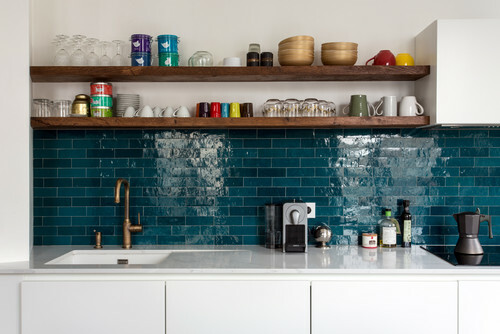 Shimmery blue-green subway tiles make a statement in this apartment kitchen in Paris. 17. 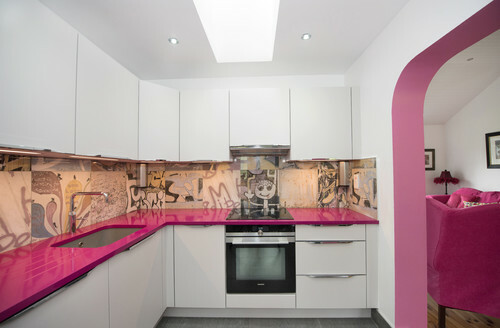 This kitchen in County Wexford, Ireland, has plain white cabinets offset by two dramatic features: the magenta quartz counter and the tiled backsplash, which features designs inspired by the street artist Banksy. 18. 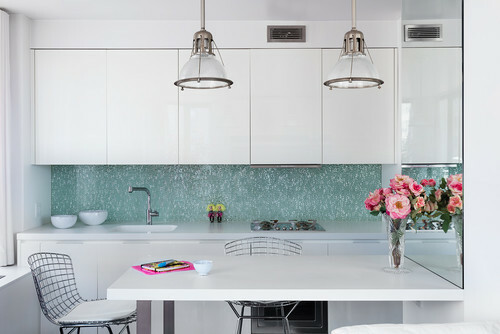 A dusty aqua backsplash with white pattern softens the clean modern lines of this pied-à-terre on the Upper East Side of Manhattan. 19. 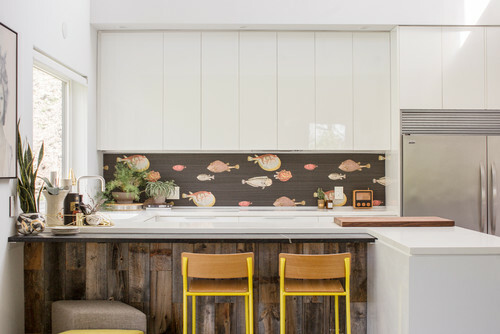 Happy color in an abstract design lights up this kitchen in Los Angeles. 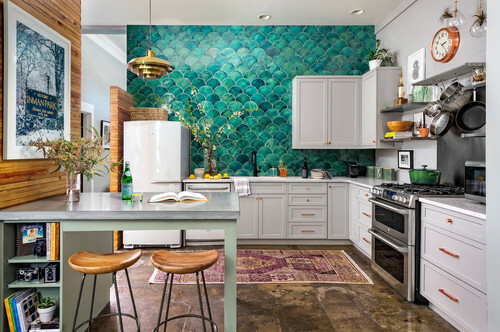 The geometric wall mural — which is actually wallpaper — also helps to unify a kitchen that has an eclectic mix of materials. 20. 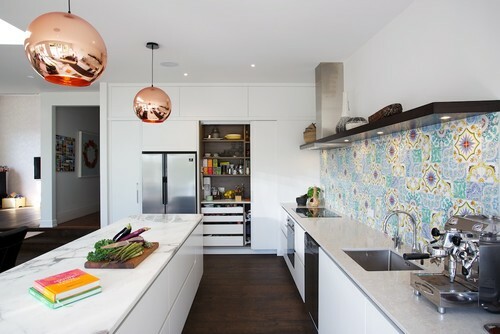 Bold tiles bring a cheerful, homey feeling to this modern white kitchen in Auckland, New Zealand. 21. 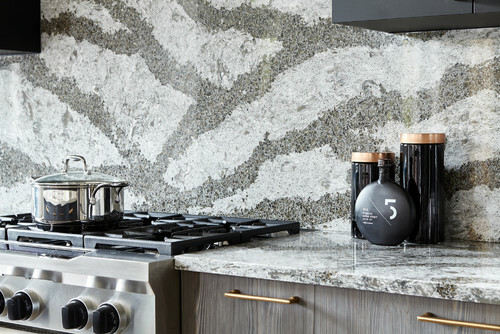 The texture of this dark backsplash brings depth to this kitchen. 22. 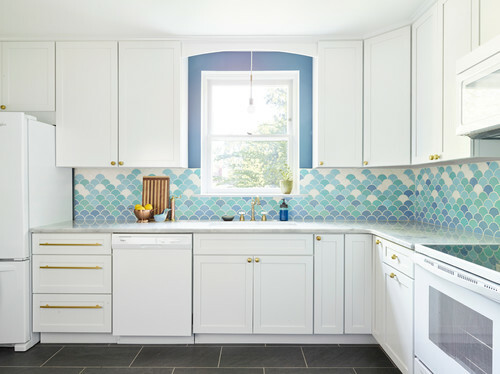 The backsplash in this Havertown, Pennsylvania, kitchen features a custom tile design with colors inspired by the ocean. 23. This kitchen floats along with its houseboat in Sausalito, California. The backsplash shown here is a mix of wallpaper featuring famous historical queens and black porcelain tile. 24. 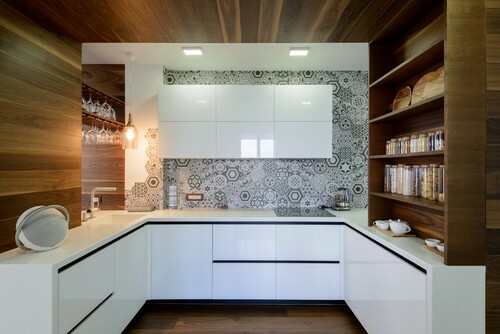 This black-and-white tile in a kitchen in Russia brings lively pattern to a space otherwise dominated by lines — in the wood pattern on the ceiling and walls, and in the gaps between the cabinets. 25. 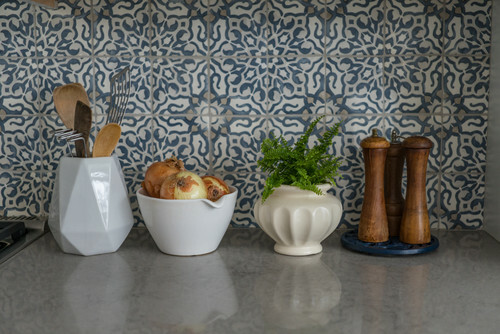 A Parisian kitchen features gray and white tiles with the classic carpenter’s star pattern often found in quilts.